Dunnottar Castle Stonehaven Scotland. The earliest know reference to this medieval fort is from 681. Most of the buildings here were built between 1400 and 1600. Because of its isolation, surrounded on 3 sides by a 200 foot drop to the sea, it was easy to defend. In 1651, when the Crown Jewels of Scotland needed to be protected, they were kept here. 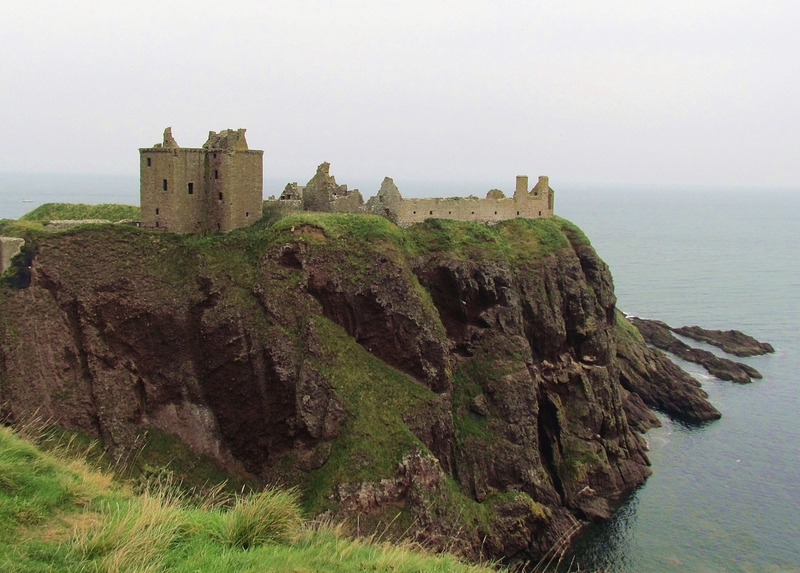 In 1297 William Wallace captured Dunnottar from the British. It is believed that up to 4000 British Soldiers took refuge in the church that had been built on the property. Wallace burned the church killing the British troops. The long low flat wall on the right side of the picture is part of the church. Kilkelly Ireland: The song tells the story of the Hunt family and their son John who came to America in 1855. When he left Ireland, John Hunt was 13 years old. He settled in Aberdeen Maryland, found a job, got married and had children. He never returned to Ireland and never saw his family again. The sole communication was the annual family letter that told John of the family news. These letters were discovered in the 1970s and became the foundation for the ballad Kilkelly Ireland. Wild Mountain Thyme: A popular Celtic song often Called "Will Ye Go, Lassie Go." It is commonly believed to be a Traditional Scottish song but that is not entirely correct. The lyrics were written/reworked by Francis McPeak in the 1950s. McPeak was from Belfast Ireland. The song was originally known as "The Braes of Balquhidder" and dates from the early 1800s. John Reilly: also known as "John Riley." The song dates to the 17th century and is based on Homers Odyssey. I learned it from the Byrds album Fifth Dimension. My version is played on the bouzouki. Ian Ruddah's Lament: Not much is known about this tune except that it dates to at least the 1500's. Here's my Autoharp version of this beautiful tune with a wee bit of Scotland the Brave tossed in. Greensleeves: A lovely English Tune sung at Christmas as What Child is this. One of my Favorites. When Irish Eyes are Smiling/ Lord of the Dance. A couple of pretty tunes on my new Autoharp.